The first of this year’s Alton Lions Craft Markets got the year off to a great start with more than twenty stalls in March with crafts ranging from fused glass to soaps, quilted memo boards to wood & cross stitch, collage pictures to paper furniture and many more. All goods are of exceptional quality and hand crafted by the stall-holders themselves. 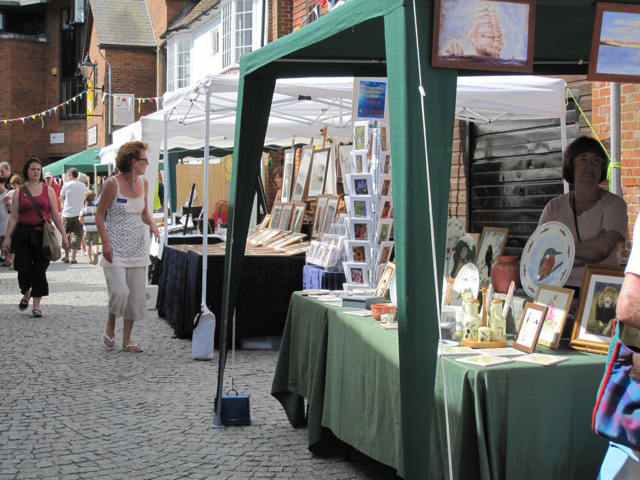 The markets are mostly held on the second Saturday of each month (except May) in Cross & Pillory Lane and Alton’s Market Square. Hampshire Farmers Market is in the High Street on the same day and together this makes for a great shopping experience in the town. So if you need something special for Easter or want to talk to a Lion come along on Saturday April 9 and check out the high standards of craftsmanship at best prices. For more details for shoppers or craft workers see www.altonlions.org.uk or www.altoncraftmarket.co.uk.